Last year, something happened to the sales figures at luxury lingerie retailer Cosabella that made the ecommerce team start to worry. Following a long period of persistent growth, suddenly it went through a flat quarter. As Cosabella Marketing Director Courtney Connell described in Campaign earlier this year, "It was very scary, particularly when we enjoyed double-digit growth all the previous quarters." It must have come as a shock. Over the previous two years, Cosabella had worked hard at growing its ecommerce arm, which was by then accounting for 15% of the retailer’s sales – nearly doubling from 8% in 2015, according to Connell. The last thing she and her team wanted was to see those figures start to plummet – and so they took action. What Connell quickly realized was that the digital ad agency Cosabella was working with to spearhead the retailer’s email marketing couldn’t produce the sort of personalization at the speed and with the accuracy she knew was needed to keep driving those sales. And so they parted ways. “We were collecting a lot of shopper data, but we didn’t have the capacity to act on it,” Connell explains. "We know our brand best and communicating it to the advertising agency became time-consuming and difficult." Instead of hiring in a new agency, Connell drew on her tech-based background and looked for an alternative technology solution. She found what quickly proved to be a great one – an artificial intelligence (AI) platform from Emarsys that would help Cosabella customize the emails it sends to its subscribers every Monday, Wednesday and Friday. “When we made that shift, we decided not to immediately hire a new agency and necessarily hire new in-house talent, but really do a full, due-diligence review of the technology in the market and see if we can fill in some of the gaps there vs. hiring more humans,” Connell said in TotalRetail. With the Emarsys solution up and running, email open rates increased by 4% almost immediately. Even more impressively, email revenue leapt 60%. What’s more, as the holiday season set in, the retailer’s annual “12 Days of Cosabella” email campaign – where a different product is put on offer each day over twelve days in December – generated, Connell estimates, 40% to 60% more sales than the previous year. What was perhaps the most surprising thing about the Christmas campaign, however, was that for the first time no discounts were offered. Instead, the emails contained highly-personalized messages and product suggestions, and that alone was enough to bump up those holiday sales so spectacularly. The AI system now running the email marketing show at Cosabella is giving the retailer personalization capabilities that simply weren’t possible in the past. Emarsys is able to target specific shoppers with specific messages based on what emails those shoppers have responded to previously, what products they’ve purchased, and a whole lot more besides. It recognizes who’s a big spender, who’s a low spender, who engages with blog content, user-generated content, who likes to click through to the Cosabella site from emails, who doesn’t. With this data, the system is able to tailor each message it sends to each customer accordingly. For example, Connell explains that a typically low spender, or a shopper that is approaching inactive buying status, might be sent an email promoting a “happy hour” sale, where she will be able to grab a 20% discount from her shopping cart from 6pm until midnight. Bigger spenders might have the discounted goods section removed completely from their emails, and be presented with promotions focused on new styles or colors instead. 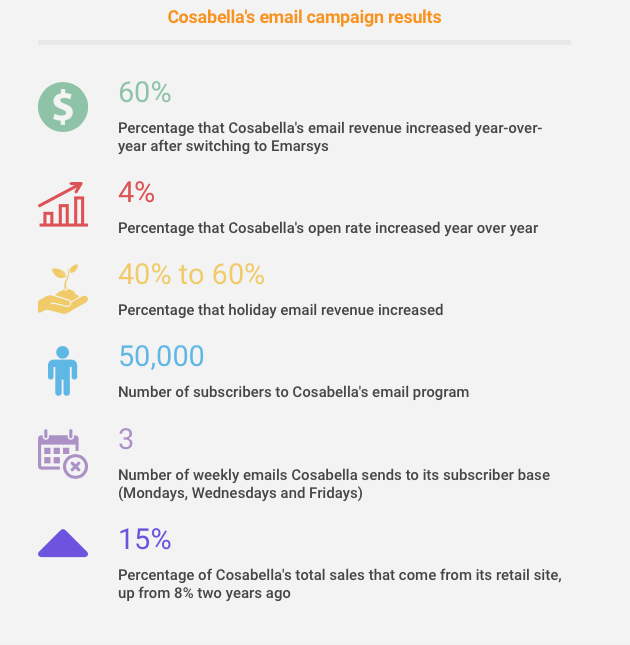 What’s more, compared to the old email marketing system that Cosabella was running, Emarsys is a breeze for employees to get to grips with. In the past, it would take an employee skilled in graphic design and HTML up to three hours to create a promotional email. But since the template-based Emarsys system is so powerful and easy-to-use, practically any member of the backend team can create an email in under an hour. And once an email is created, Emarsys is able to automatically shift around its content – such as the call-to-action (CTA) – or change color schemes based on what it already knows about the shopper’s preferences and habits. The data that the new AI system is able to collect and render actionable has indeed completely transformed Cosabella’s email marketing operations. Instead of sending an email blast to all of its subscribers promoting the exact same thing at the exact same time, Emarsys is constantly testing, constantly looking for spending patterns, constantly evaluating what type of customer is responding to what. “We can see who’s defecting, what our win-back rates are among defectors, what our win-back rates are among inactives, what our repurchase rates are among new customers, etc.,” says Connell. Indeed, it does. And while the artificial intelligence system is doing its thing and producing results far greater than what the retailer has ever experienced before, the Cosabella marketing team is freed up to focus on more creative tasks, such as producing more stimulating content and engaging more personally with customers. Indeed, as AI eliminates the need for staff to become bogged down in repetitive, mundane work that routinely fails to inspire them, the whole team is lifted into creativity and committed to doing their jobs better – and that’s something that Cosabella believes is invaluable.